"The King & Us": A trip to the museum inspires Veronica and Betty to imagine what it would be like to rule ancient Egypt! "What's in Store? ": For a change of pace, Mr. Lodge suggests that Veronica do the grocery shopping instead of the servants...and he sends Betty along to make sure she does it... read more right! "What's in a Name? 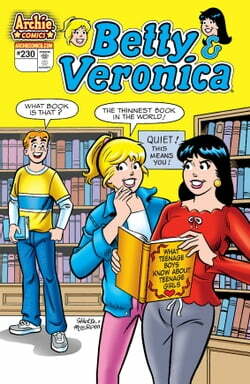 ": Veronica swoons over the new hunk in school. .. until she learns his last name! "Unexpected Results": As they await the results of their career day tests, Veronica insists Betty and Midge won't qualify for the glamor jobs. Wait until she sees her own results!